NSW residents – we’ve got two Sixers BBL prize packs up for grabs for the Sixers vs Melbourne Stars game on 27th Dec at the SCG! First prize includes the opportunity to do the Coin Toss before the match, your very own Sixers BBL08 shirt AND 2 x Tickets to the game. The winner of the second prize will receive a Sixers BBL08 shirt and 2 x Tickets to the game. To enter, upload a photo you supporting the Sixers and using the hashtag #iiSupportSixers and tell us why you should do the Coin Toss before the match. 1. iiNet Limited (ABN 48 068 628 937) of 63-65 Waterloo Road Macquarie Park, Sydney NSW 2113 (“we” or “us”) are responsible for conducting the “Sixers’ Coin Toss Competition” (“the Competition”). 3. A copy of these Terms and Conditions can be read at http://blog.iinet.net.au/sixers-coin-toss-competition-tcs/. 4. The Competition commences at 00:01 AM AEDT on Wednesday 5th December 2018 and closes at 11:59 PM AEDT on Tuesday 11th December 2018 (“Competition Period”). 6. Entry is open to Australian residents in New South Wales aged 12 years or over at the date of entry. If you are under 18 years old, you need to obtain consent from your parent or guardian to enter and to provide your personal information to us. Employees (and their immediate family) of iiNet Limited, Sydney Sixers and the TPG Telecom Group are ineligible to enter. 7. Employees (and their immediate family) of iiNet Limited, Sydney Sixers and the TPG Telecom Group are ineligible to enter. Upload a photo of you supporting the Sixers onto the post on iiNet’s Facebook, Instagram or Twitter account together with the hashtag # iiSupportSixers and a caption telling us why you should do the Coin Toss.(“Entry”). 9. You can enter as many times as you like during the Competition Period, just make sure your Facebook account settings are public so we can see your post. 10. A person may only win one prize. 12. You warrant that each Entry is an original work created solely by you, that the Entry does not infringe on the copyrights, trademarks, moral rights, rights of privacy/publicity or intellectual property rights of any person or entity and that no other party has any right, title, claim, or interest in the Entry. 13. We reserve the right to check the validity of all Entries and to disqualify you if we reasonably believe that your entry does not comply with these Terms and Conditions or the Entry process has been tampered with. 14. Entries that are considered, in our absolute discretion, to be incomplete, incomprehensible, unlawful, defamatory, abusive, obscene, sexist, racist or otherwise inappropriate will be deemed invalid and rejected. We reserve the right to provide law enforcement bodies with the objectionable Entry and the entrant’s personal information. 15. The Competition is a game of skill. Chance plays no part in determining the winner[s]. Each Entry will be judged according to its originality and creativity. 16. The ‘Entry’ determined by us to be the most original and creative from the Entries received during the Competition Period (“Winner”) will win a Prize as detailed below. 17. The Winners will be determined at Level 1, 502 Hay Street Subiaco WA 6004 on Thursday 13th December 2018 at 2pm AEDT. 18. The Winners will be notified on Thursday 13th The winner must claim their Prize by 5pm AEDT on Thursday 20th December 2018 or they will forfeit the Prize and will no longer be the Winner. The Entry judged by us to be the next best Entry will become the winner (“Replacement Winner”). If the Replacement Winner does not claim their prize within 2 business days of our notification, that Replacement Winner will forfeit the Prize. 19. If the Prize is forfeited by a Winner or Replacement Winner (for whatever reason), we may conduct further judging until a Replacement Winner is successfully contacted by us and awarded the Prize. First Prize: the opportunity to do the coin toss at the start of the game as well as two (2) General Admission tickets to attend the Sixers versus Melbourne Stars game on the 27th December 2018 at the Sydney Cricket Ground as well as one (1) Sydney Sixers 2018/19 Men’s or Women’s on-field replica shirt. First Prize is valued at approximately $1050 incl GST. 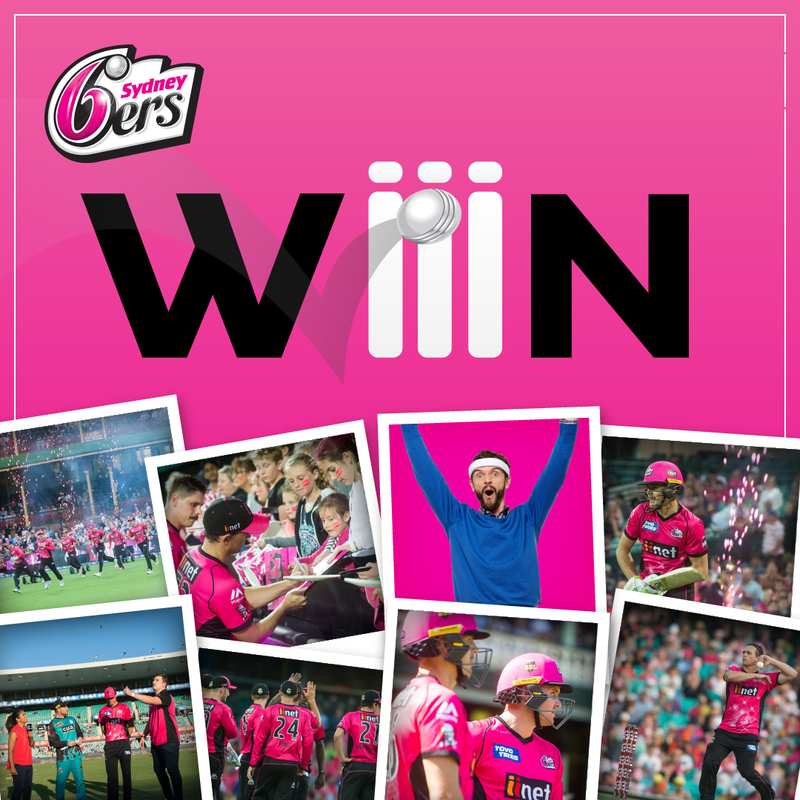 Second Prize: two (2) General Admission tickets to attend the Sixers versus Melbourne Stars game on the 27th December 2018 at the Sydney Cricket Ground as well as one (1) Sydney Sixers 2018/19 Men’s or Women’s on-field replica shirt. Second Prize is valued at approximately $150 incl GST. 22. The Prize does not include any other costs or expenses such as accommodation or transport to and from the Sydney Cricket Ground. The Winner must make their own arrangements to attend the matches. 27. You agree to us publishing your name and entry (and, if requested, a photograph of you), free of charge, in any media (including social media) for the purpose of promoting this competition and/or our products. 28. We recognise that you retain ownership of the copyright in each of your entries. You grant us a perpetual, non-exclusive, irrevocable licence to use the entry in all media throughout the world for marketing and promotional purposes in connection with the competition. 29. We reserve the right to suspend, cancel or modify the competition if necessary, due to circumstances beyond our reasonable control. We will take reasonable steps to notify you of any such change. 30. Nothing in these Terms and Conditions limits, excludes or modifies the consumer guarantees provided under the Competition and Consumer Act (2010) or any other statutory rights that you have that cannot lawfully be excluded. 31. To the extent permitted by law, we exclude and you irrevocably release us and our employees and contractors from, all liability for any loss or injury suffered by you in connection with your participation in the Competition or any of your activities in connection with any prize that you win as a result of your participation in the Competition, except where such loss or injury is caused by our gross negligence. 32. We are not responsible for any incorrect or inaccurate information, either caused by promotional website users or by any of the equipment or programming associated with or use in this Competition, or by any technical error that may occur in the course of the administration of this Competition. We are not responsible for any error, omission, interruption, deletion, defect, delay in operation or transmission, communications line failure, theft or destruction or unauthorised access to or alteration of Entries. 33. These Terms and Conditions are governed by the laws of New South Wales.